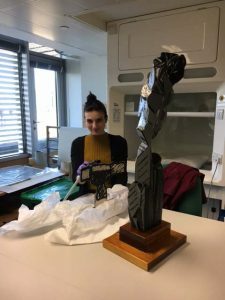 In this week’s blog we bring you another edition of our volunteer voice, this time from Valentina de Riso, who volunteers in the conservation studio every week…. I’m from Italy and I’ve come to Scotland to study for an MSc in Comparative Literature at the University of Edinburgh. What do you do when you are not volunteering? I am a book lover and I have a passion for literature. When I’m not volunteering I love reading, writing short-stories and exploring the city of Edinburgh. 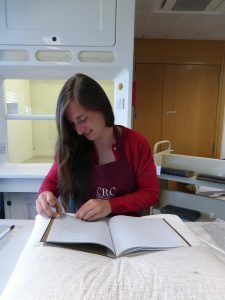 I am also keen on old and used books, so I often happen to be in some second-hand bookshop, sniffing between pages and looking for rare books!